Some people have defects on the gene SLC22A5, giving them problems with their OCTN2 transport protein (Organic cation transport). OCTN2 transports carnitine into the mitochondial matrix where it can be used to create cellular energy. Treatment indications for individuals with the defect on SLC22A5 includes oral or intravenous carnitine supplementation. But the condition of these patients often improves with supplementation. So the carnitine is getting in there somehow. 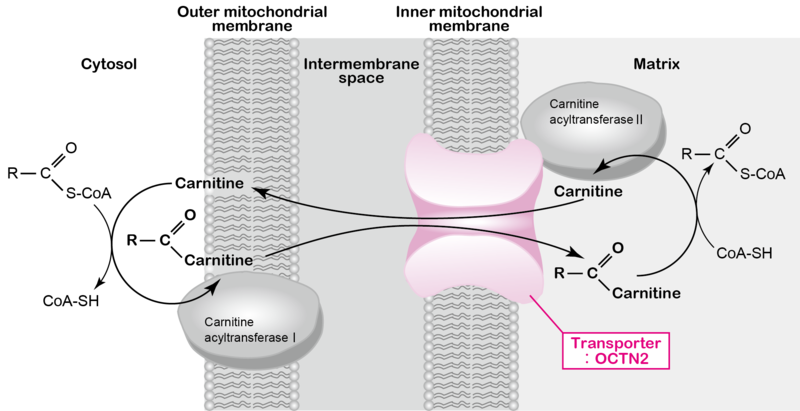 Is there another route via which carnitine enters into the mitochondrial matrix? Short answer -- looks like the image in my question might be flawed, and OCTN2 probably isn't even involved in inner mitochondrial transport. Lesson: don't believe everything you find on google image search! Longer answer - So I went back to the page where I originally found the image and saw that Dr. Ikumi Tamai was featured as one of the researchers who originally described OCTN2 back in the late 90s. So I contacted Dr. Tamai via email-- and he responded to me a few hours later! In his response, Dr. Tamai stated that while OCTN2 is expressed in various places in the body -- it is mostly active in the kidney -- and works there to conserve blood carnitine by re-capturing it from urine and returning it to the blood. He added that jvm mice (which have defects in OCTN2 that cause carnitine deficiency) respond favorably to carnitine supplementation because the defect mostly just lowers blood carnitine levels, and simply raising those levels improves the condition of the mice. This seems to suggest that OCTN2 does NOT play any role in transporting carnitine within the mitochondria. Dr. Tamai noted that the image, which seems to depict OCTN2 sitting on the inner mitochondrial membrane, might have been designed by someone who did not fully understand the science of OCTN2, and that different transporters are likely responsible for the transporting of carnitine into and out of cellular and mitochondrial membranes (not OCTN2!). In short -- it seems like that little pink blob in the image above should NOT be OCTN2 (even though it is labeled as such) and should probably be another transporter altogether. Not the answer you're looking for? Browse other questions tagged proteins cell-membrane protein-expression membrane-transport or ask your own question. Can the Donnan effect be reversed so phospholipids follow ions? Can Oxaloacetate cross the outer mitochondrial membrane? Can the Na+/K+ pump backwards to generate ATP?